Even though my children eat very little fruits, I keep on buying them…I know, I know…believe me but nothing goes to waste at my house, it just means that I have to either be creative to cook what I buy, or find recipes that inspire me:-) This week, while I was looking for ripe mangos to make sorbet, I saw those beautiful pineapple, papayas, star fruit… and of course I had to buy them:-) Now I have to find recipes to fix all of that. 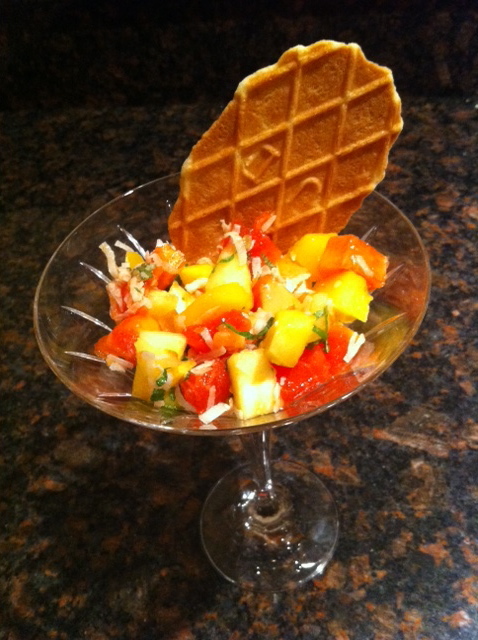 But last night, I thought a good light fruit salad would be a good ending to my meal…so here it is. Ingredients: 1 cup of pineapple, 1 cup of diced mango, 1 cup of diced papaya, 2 Tbsp of coconut flakes, 2 tbsp of brown sugar, 4 tbsp of flavored rum ( I had vanilla rum from St Marteen). 1 tbsp of crystallized Ginger chips. 6 leaves of mint chopped very thinly. Rum Flavored whipped cream. Dice all the fruits in very small cubes. In a large bowl, place all the fruits, the rum, the sugar, the mint and mix well. Set aside for 1 hour so that the fruits will absorb the rum. Before serving add the coconut, the crytallized ginger to the fruit mixture. 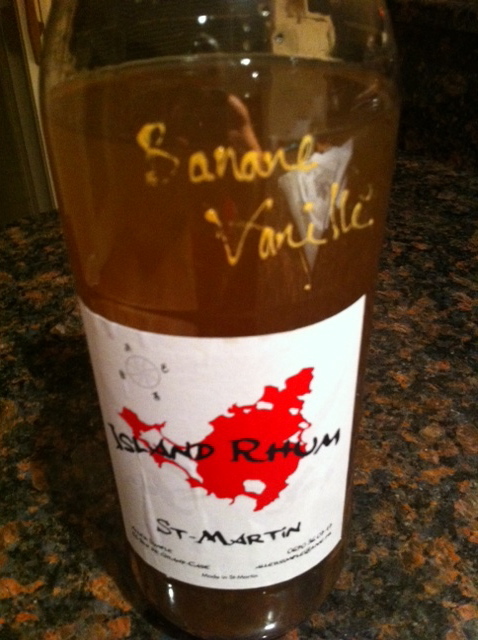 Rum Flavored Whipped Cream: Place 1 cup of heavy cream and 2 tbsp of rum in the bowl of a mixer. Mix on high until the cream starts forming peaks. Add sugar if needs be, maybe 1/2 tbsp. Serve the fruit salad in martini glasses. 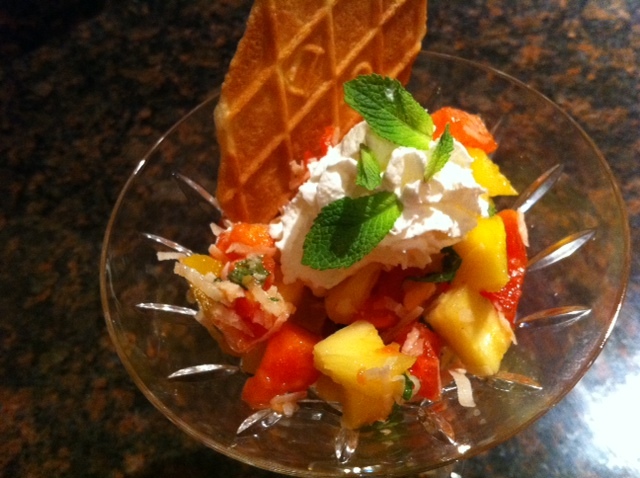 Top the fruit salad with a dollop of whipped cream. Chop a few mint leaves and sprinkle them on top of the whipped cream. Serve with speculos. Yum!